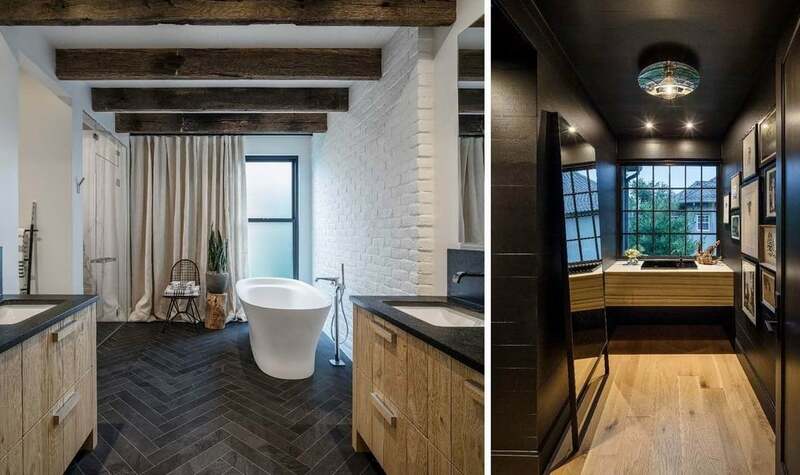 A Scandinavian-inspired ensuite & a bold, black powder room were winners at the North American NKBA awards. Two bathrooms that have already won awards here in Ottawa have gone on to claim North American honours at the National Kitchen & Bath Association (NKBA) awards in Las Vegas last month. And both rooms were designed by the same person — Janik Lemery of Astro Design Centre — as part of the same home. 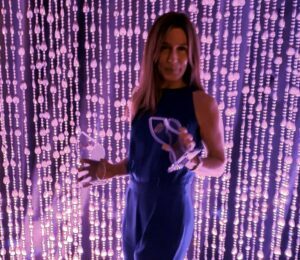 Janik Lemery shows off her trophies at the NKBA awards gala. The 2018 Design Competition awards were presented at a gala as part of the annual Kitchen and Bath Industry Show held from Feb. 19 to 21. The competition recognizes excellence in design and execution of residential kitchen and bath projects and is open to NKBA members from across North America. Lemery won first place in the powder room category and third place for large luxury bath. 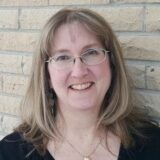 Both projects were first place winners at the local NKBA awards held last spring. “It was a joint effort from our design team at Astro, and so to me this isn’t just a win for myself, but for Astro representing in the North American kitchen and bath industry,” Lemery says. Her winning projects were a dramatic powder room that went bold in black and a soothing ensuite that took its cues from nature and Scandinavian spas. She sought to create a space that was dark and impactful. The room is heavily centered on a large loft-inspired window above a floating marble console. Realizing that powder rooms should feel more like a hidden gem in a home than a utility space, she opted to omit the conventional vanity. Instead, a suspended counter made of Cipollino D’Oro marble was installed. It softens the space while the stone’s linear nature accentuates the strong horizontal design of the piece. 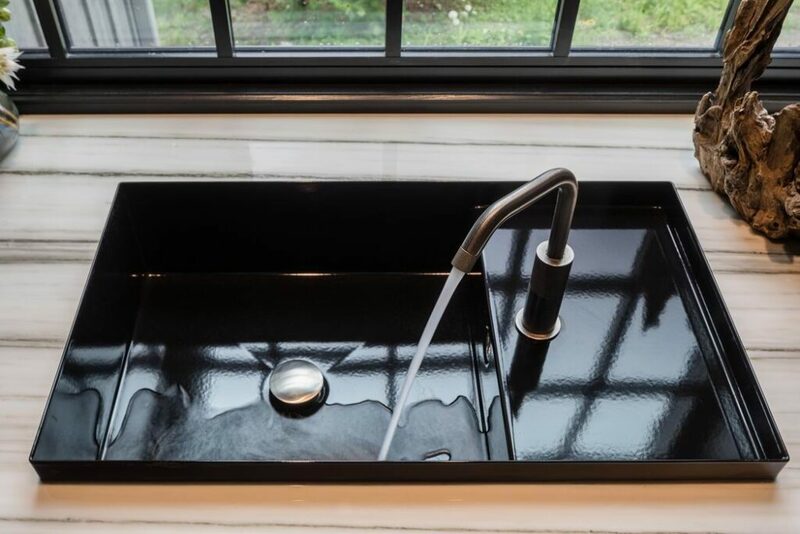 An unusual semi-recessed sink made of thin steel powder coated in a gloss black finish is set into the vanity, with the faucet placed on top of a recessed platform that runs into the sink. To create a bit of lightness in the space, the wide plank white oak hardwood from the hallway was continued into the room. 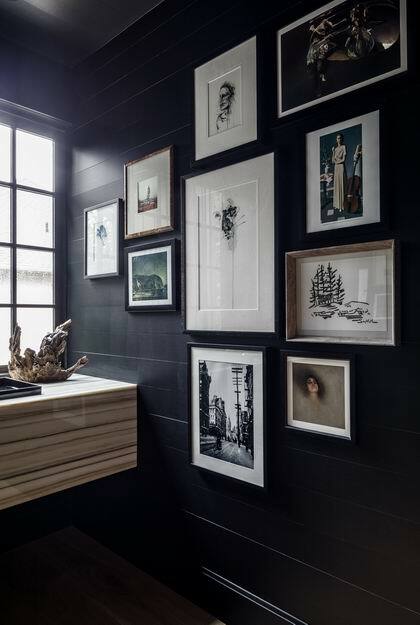 Shiplap covers the walls for subtle texture and is painted in a matte black that is carried up onto the ceiling. To keep the focus on the vanity, a black wall-hung toilet is tucked away in the corner. “The master ensuite was designed with a Scandinavian design in mind and had uniqueness to it that we don’t see very often,” says Lemery. Feeling that a master bath should be calm and refreshing, a sanctuary to rejuvenate after a long hard day, she took cues from nature and the spas of Scandinavia to create a space that evolved into exactly that. At first glance, the space appears to be just a large sculptural matte stone bath flanked by matching vanities, with the toilet and shower remaining discreet. What sets it apart is how the materials used are combined in their most natural states. Flamed black granite floors in a herringbone pattern create a solid base to all other features in the room. The vanities are made of solid planks of chestnut, topped with Canadian soapstone counters. 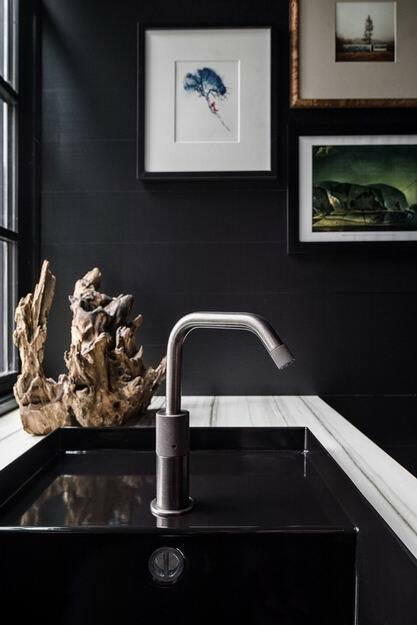 Wall-mounted faucets are set on top of a solid soapstone backsplash. 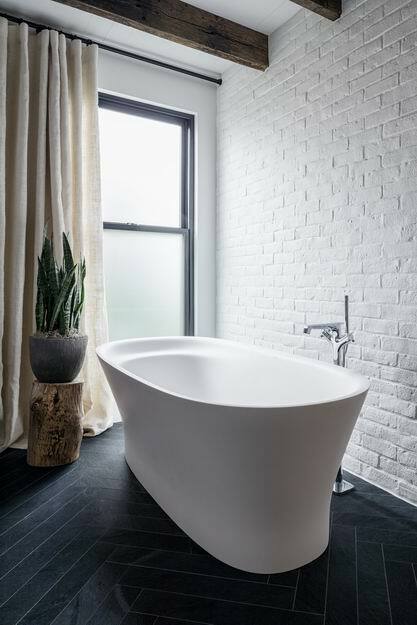 A painted reclaimed brick wall was installed behind the bath for interest, without being distracting. And a wall covered in natural linen/burlap draperies create a sense of warmth and softness. Opposite the tub is a custom walk-in steam shower clad in honed Statuario marble. 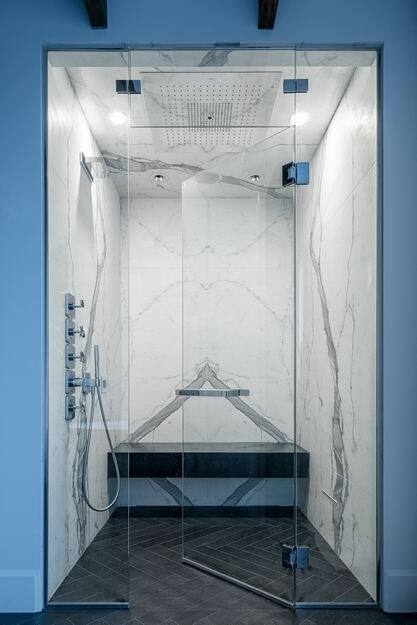 It features a suspended soapstone bench for enjoying the Chroma therapy steam room and a large rain head shower centred in the space for showering. 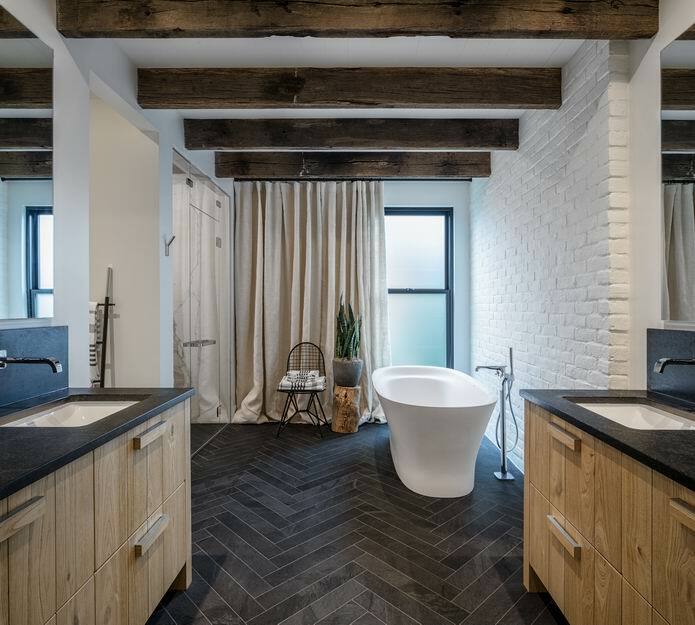 “With custom Italian oak vanities, dark chevron floor and a white brick wall, I was so happy with the way this bathroom was executed,” Lemery says.